One of the strengths of the Venturing program is its ability to meet the interests of all Venturers. Sometimes Venturers like to investigate new, different areas. Variety in a crew always seems to make it more fun to go to meetings and outings. Also, Venturers probably have many interests or would like to have more. Because of that desire, and to provide a pathway to many different experiences, the Venturing awards program is offered. For the awards in Arts and Hobbies, Sports, or Religious Life, a Venturer must complete at least nine of 12 requirements for each of those three areas. For the Outdoor award, Venturers must complete at least four core requirements and two electives that are found in the Ranger Award requirements. For the Sea Scout award, Venturers must complete half the requirements for Sea Scouting’s Quartermaster Award (Ordinary rank). Venturing Bronze Award candidates may have their crew Advisor or a specialty consultant approve or sign off on a completed requirement. 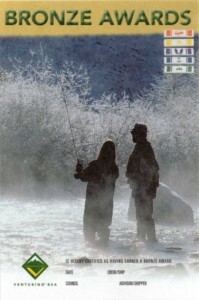 Requirements for the awards in Arts and Hobbies, Sports, and Religious Life, as well as the Venturing Gold Award can be found in chapter 10 of the Venturer/Ranger Handbook, No. 33494C. Requirements for the Sea Scout award can be found in the Sea Scout Manual, No. 33239C. The requirements for the Outdoor award can be found in the Venturer/Ranger Handbook. 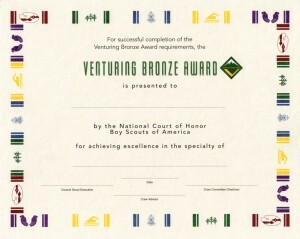 There is no committee review for Venturing Bronze awards. The Venturing Bronze Award is a colorful, campaign-style ribbon that may be worn on the Sea Scout or Venturing uniform. 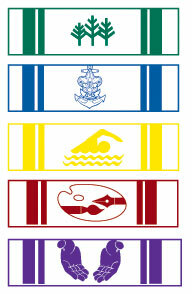 If all five are earned, all five may be worn on the uniform. The ribbons have an icon representing the area in which it was earned superimposed on the ribbon.